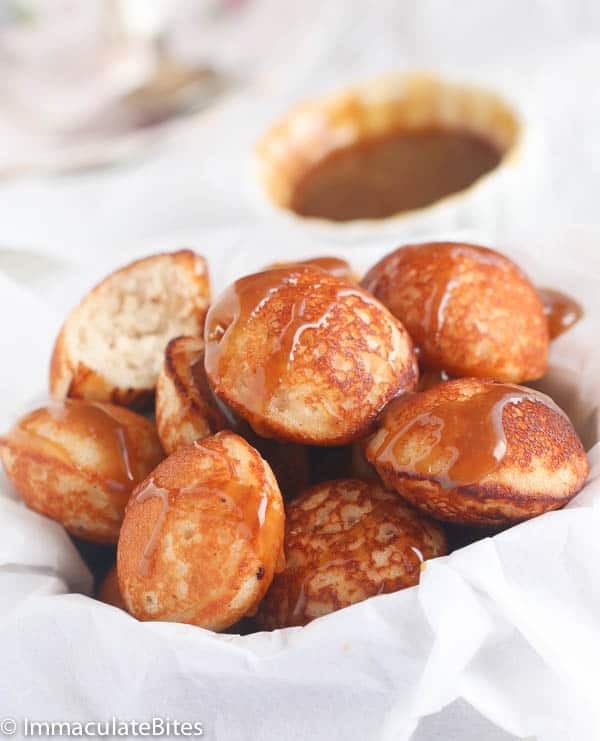 Vitumbua– An addictive healthy coconut and rice vegan donut or pancake topped with vegan caramel- a melt in your mouth experience. Don’t mention anything coconut to me, because chances are I would like to taste or make it. Every time my son sees anything coconut he screams out for me, like is an emergency (He is so dramatic). And everyone turns to look. It’s embarrassing, sometimes, especially when we are out in public. I look the other way and start whistling. He loathes Coconut and I am obsessed with all things coconut. Just a cursory glance on this site and you would definitely agree with me. 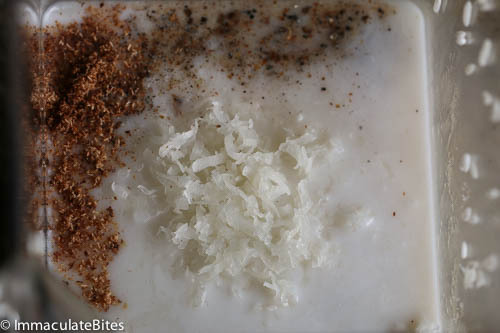 I have all forms of coconut in my pantry, powder, flakes, liquid, shredded unsweetened, sweetened- you bet! And more than twenty coconut recipes to try out on my to do list, they all have a deadline. I don’t want to scare you away so am going to space them out. This right here has been on the list, until now. It is ready to shine. These East African Breakfast are happily eaten and shared in these Swahili countries Kenya, Tanzania, Zanzibar, Uganda, Zambia, Mozambique, Malawi, Rwanda and Burundi, Somalia. Even throughout India, Indonesia under different aliases. Can you believe after I made these hubby grabbed a few, then exclaimed! “You just made my favorite childhood snack”, he was so excited that he finished the whole thing and started reminiscing about his childhood. Oh, this would do that to you! This is my variant on this sweet snack, the spice combination that I like using is cardamom, nutmeg and almond extract. It is typically made with cardamom; feel free to adjust spices with one or more according to taste preference. Most recipes recommend using short rice. I used jasmine rice with good results. 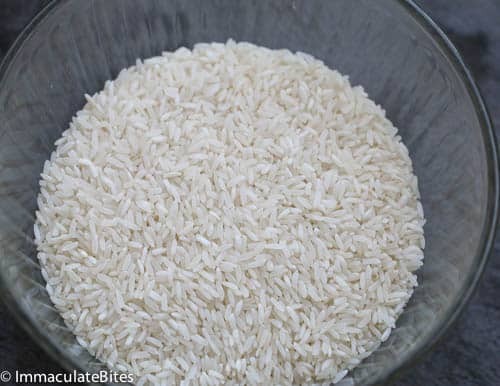 Soak 2 cups of rice in a large bowl and let it soften, this might take 4 hours or more, preferably overnight. Drain the water completely and add in a food processor or blender together with coconut milk, flakes, spices, sugar, salt and yeast. Blend until puree, you might have to do this in batches depending on your blender- make sure you pause in between and check for smoothness. 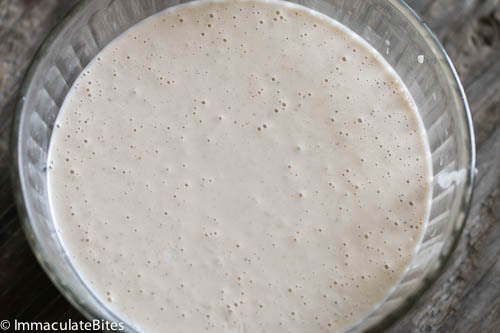 Pour in a large bowl, cover and let it rise in a warm area until doubled in size or when you see bubbles forming. Heat a vitumbua, or fry pan on medium heat, add about a ½ or more teaspoon of oil, and brush the holes with the oil. Make sure pan is warm enough before adding batter about ¾ full. Cook for about 2 -3 minutes on each side, then quickly flip using chopstick. Continue cooking on the other side and repeat this process until all the batter is finished. Let it cool slightly and enjoy with chai or caramel dipping sauce. 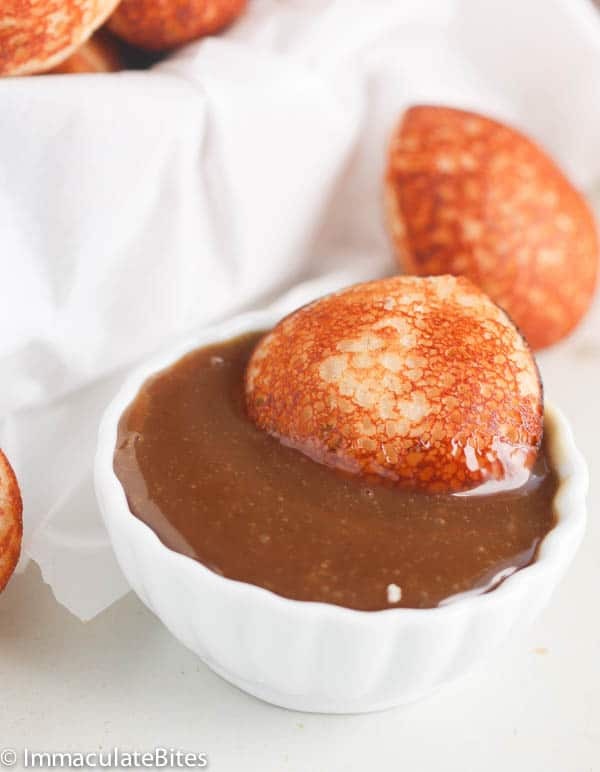 Bring the coconut milk and brown sugar to a boil together in a heavy-bottomed pot or skillet. Reduce heat to medium low; cook and stir frequently until the mixture is thick and the volume has reduced by about half, about 20 minutes or more. If you like coconut, try Udupi cuisine. That the traditional cuisine from the city of Udupi in west coast of South India. Rice, coconut and jaggery together are used in hundreds of combination for breakfast, lunch, snacks, savouries and most of all for desserts. I am excited to make these. 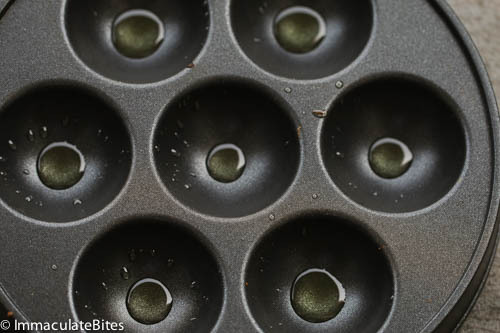 A few questions….do you put the pan on the stove or on a skillet to cook? Is it the same outcome if you use a stove? Also, what is the best storage when cooked? How long do they keep? I do put the pan on the stove . Never tried using a skillet .You can freeze, then warm in the oven when ready to eat . I usually use whatever recipe I have available. The problem is not with the quality of rice – it’s with the rising/ and or yeast. Your masa has to rise before cooking, for it to puff. 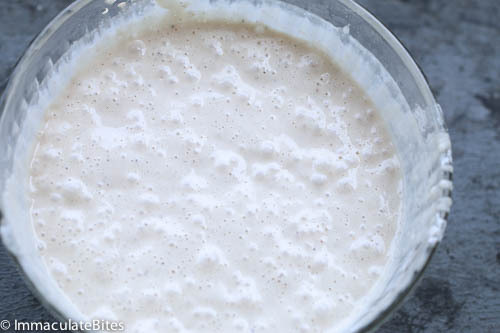 Double check your yeast make sure it’s fresh. You can put it’s not going to puff the same way. Please note that this.recipe.is also prepared in the Comoros Islands. Good to know! Thanks for sharing Karim!!! Oh, we have the same rice coconut pancakes in Madagascar. 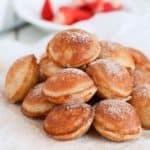 They’re called “mokary” and I they were my favourite breakfast when i was growing up there. I just found out about your blog and i just loooove it!!! The recipes are just yummy and i love the photos! I am going to be making these for my childs geography class, they have been learning about Africa and we are all bringing in foods from Africa, these look amazing and even I can eat them! I can’t have dairy or gluten and these are something that works for people like me! Thanks!! No I don’t. When you soak it overnight it gets soft , so you can easily grind it. Can I use less sugar in this recipe? Perhaps 1/3 cup of sugar? You sure can. Adjust to suit your taste buds. I absolutely looove your blog; my resolution this year is to recreate recipes of the food I grew up on so I’ll definitely be spending a lot of time checking out your blog! Awesome ! Glad to have you here.Thank you for taking the time to let me know . Do let me know which ones you try out. What happens if I don’t leave it to rise(company coming soon) . Will they still be fluffy. I will using instant yeast. They wouldn’t be fluffy. The dough has to res in order to rise . 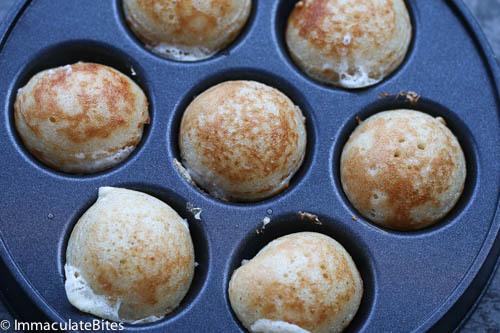 This looks great for my celiac daughter to have when I serve aebelskivers and bet the same pan can be used. Luckily i have two so therr will be no cross contamination. My Pleasure! Win Win for Everyone. Hope she does enjoy them. At first sight I wondered if it was an Indian food blog. 🙂 Vitumbua, channa curry, bhajias, yellow rice, pilau, samosas.. Amazed at how our cuisines are intertwined! Aww thanks Navya! Heading over to check your blog. Hi! I was wondering what temperature the oven should be set at if we cook them in the oven? thanks for your help! 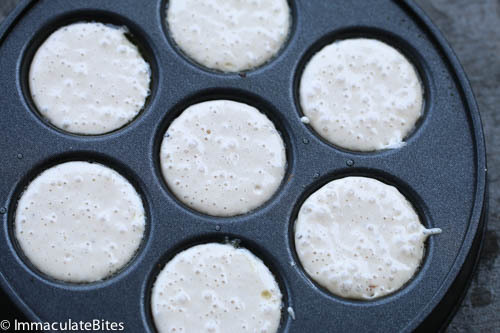 They should be set at 350 Degrees F.
These are just like we do south India … they are called by various names padding, appam paniyaram. Love them. We have sweeter version too. It’s a small world Bhat! Thanks Brian! They really taste good. Is your hubby East African? Thanks for the recipe. I’m so sorry for d disturbance so far just that I want everything I do to come out perfect.pls can I use my cupcakes pan cos this my first time of hearing vitumbua pan,haven’t heard it b/4 not to talk of seeing it. Hi Juliet! No disturbance at all. Yes you can use a cup cake pan, add about a 1/2 teaspoon of oil or more , let it heat up before adding batter. Then bake in the oven for about 5 minutes each side. Pls Imma can I use ground rice? Quick question; if I don’t have the vitumba pan and I was using a normal frying pan, will I use the the same amount of oil called for in the recipe and will my cakes still hold their shape? Naa, you know what? I think oil is just a matter of preference- sometimes I use more sometimes I don’t. 1/2 teaspoon would do just fine, make adjustment as you go. 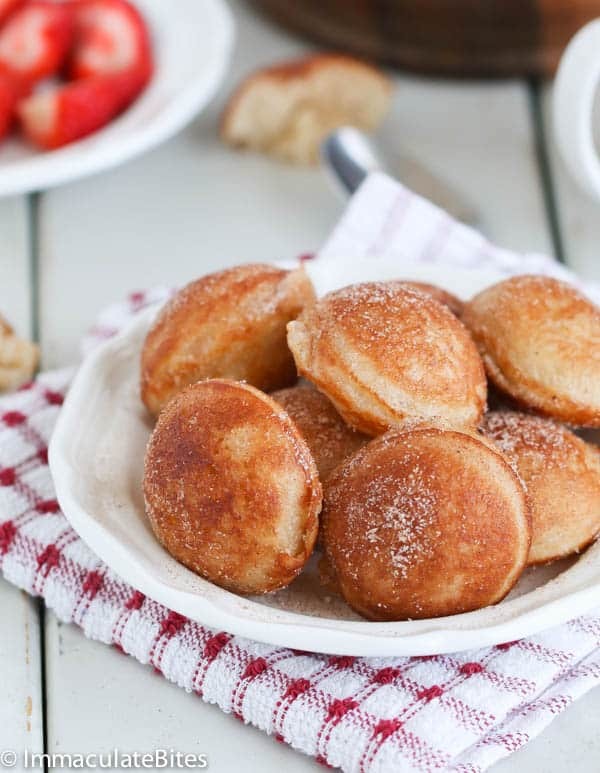 awwww…..I have always wondered how to make masa. In Ghana we have it with a spiced millet/ sorghum porridge. I asked my mom once how it was made but u know these old ladies…..u take a bit of this and add a dash of that they did say……..Thanks for the recipe . You are a darling. Aww, thanks Sometimes, all I want is for it to taste good and am good with it. 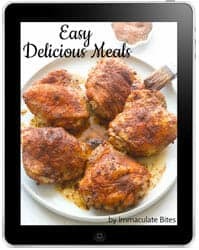 Thanks for trying out my recipes and providing feedback. 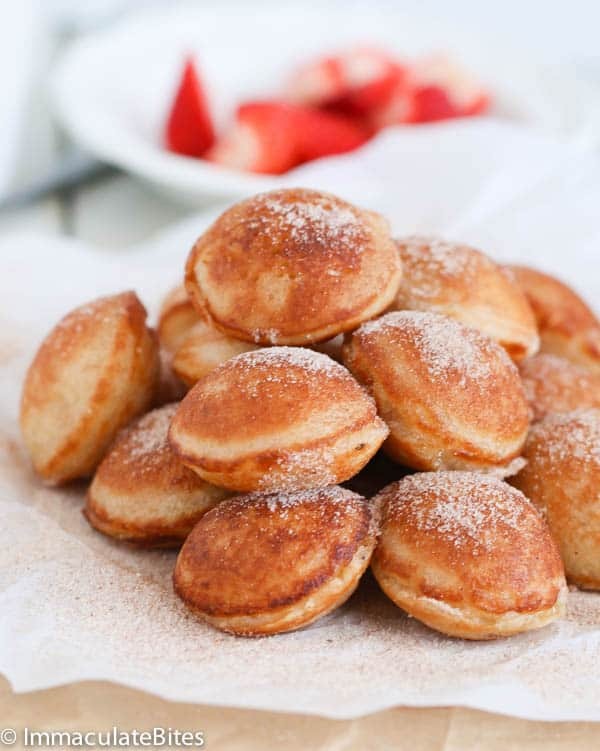 The pan is called Ebelskiver pancake pan. I just ordered it from Walmart. I live in New york. This looks like a great recipe. Think I will try it in a few. No stupidity here Maureen ! My bad! 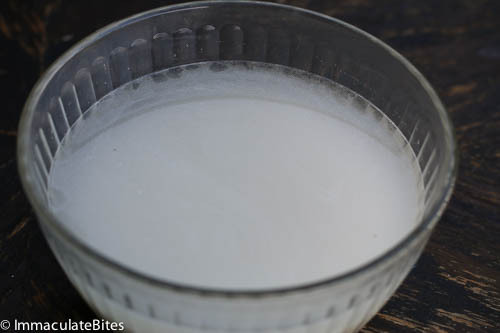 Recipe updated – I cup of canned coconut milk. Thanks for pointing this out to me. Gurrrrl! you don’t waste time time eh? I like that ! Make sure you make the sauce to go with it. I know what you mean about palm oil, it is somewhat of an acquired taste . I grew up eating it, so I don’t mind using it in some recipes. If you are new to this be sure to use half or what is called for and sub the rest with cooking oil. I googled Vitumba Pan and ordered it. I can’t wait. Btw…..I made some red red black eye peas today. Am not sure I like the taste of palm oil. Maybe I used too much or maybe it didnt cook well enough. Lol. My husband is guzzling it down like candy though. They look delicious. What kind of pan are you using? What is it called? I need it cos I will be making these for my next tea party. OMG! Imma these miniature coconut rice pancakes are adorable. I’m definitely giving them a try over the weekend. I’ll be using brown rice instead, I’m assuming this should be okay? Yes, brown rice would work too, make sure it is blended into a smooth consistency. Hi ! This recipe looks yammy 😉 The rice has to be cooked or not? No you don’t have to cook the rice. After soaking the rice overnight it makes it easier to blend.